The United States is known to have many millionaires and billionaires. But it turns out that not all states are equal when it comes to the rich and powerful. Where does your state fall? 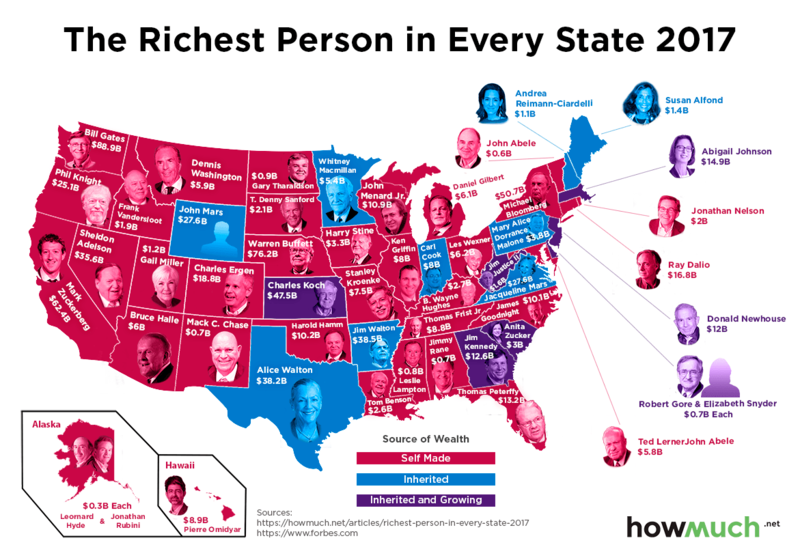 Take a look at the map below to see the richest person in every state. A photo of the richest person in any given state is superimposed on each state in the map, along with the person’s name and net worth. States are color coded based upon how the richest person in that state attained his or her wealth: red for self-made, blue for inherited and purple for inherited and growing. There is a total of 52 wealthy individuals on the map because there was a tie in two states. The data were collected from Forbes. An outright majority of the richest people in the states are self-made. Nearly all of the wealthiest people in Western states are self-made, while a more mixed group is found among the richest individuals in Northeastern states. There is also a small trend found in familial ties. The wealthiest person in both Texas and Arkansas – Jim and Alice Walton - are from the family that founded retail giant Wal-Mart. The Mars family, the founders of the Mars candy company, also appears twice on the map; John and Jacqueline Mars in Wyoming and Virginia. Although the individuals found on the map represent the wealthiest person in each state, the net worth of each person varies to a significant degree. The West Coast – California, Oregon and Washington – is home to some of the wealthiest people in the country. This includes Bill Gates, the wealthiest man in not only the U.S. but the world. The wealthiest person in states with a small population, like Midwestern America states, tend to have a relatively lower net worth compared to larger states. But there are a few notable exceptions, including the world’s second wealthiest man Warren Buffet in sparsely-populated Nebraska. There are many millionaires and billionaires found throughout the United States. But some states, particularly highly populated states, are home to the ultra-rich, while other states with smaller populations tend to be home to individuals with relatively lower net worth. It appears that the further you go West, the more you find wealthy individuals that are self-made, rather than inheritors of large fortunes.